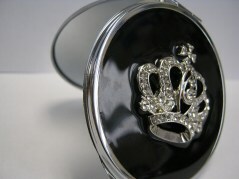 I have a very limited quanitity of these Princess Mirrors (only 5). This mirror is a reminder that not only are you fearfully and wonderfully made, but as a daughter of the King, you are a real princess. It includes a note from me about the beautiful creation God made when he made you. This would be a great partner with The Real You short study by me. Purchase together for a discount, and the book will be autographed by me. Just in time for Christmas! CLICK THE SHOPPING CART TO PURCHASE. HURRY WHILE THEY LAST!